Time will tell, but it looks like it will do it’s job. Bet you are glad to have that done. Glad to be done before we get into the 100’s! I always thought it would be cool to have a bridge that was just an old railroad flat car dropped into place. That would probably sink to the axels in the soft ground here! So long as it’s not the bridge at Arnhem ! Operation Market Garden was a huge disaster! Thanks Buddy! I’m back to playing in the dirt I guess! That looks great! Wasn’t that a perpetual ‘slump’, or ‘slough’, or something like a semi-dry pond? I remember you always saying it was like a swamp. Hopefully it’ll stay drained now…. Hi Jim! Yeh it’s the place that dries out the slowest, and may need expanding but it should drain easier now, plus the ground is built-up more from the house side and that should (fingers crossed) assist in run-off. Here’s hoping it works As Designed. 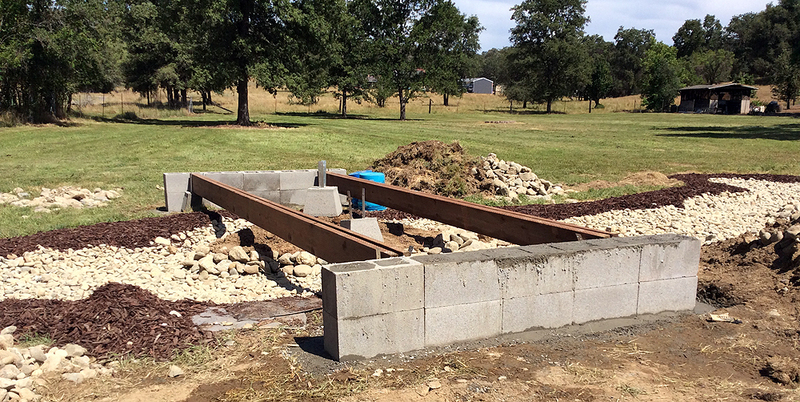 A lot more ambitious than out little front yard project, but then we only have about 11,000sqft to worry about…. Yours will be easier to maintain! I’ve got about 200’x300’ feet of weeds! Got some extra ambition to spare? I’ll just have to muster and wait, I suppose. We have the weather, but it took a team (and a bit of money) greater than myself to pull this off!